This week, Barcelona's Mayor Ada Colau and the vice-mayor of the city will visit Copenhagen. Colau was elected in May 2015, for the alternative left and green coalition "Barcelona en Comú" - or Barcelona Together. We're sure there the Barcelonans will harvest a great deal of inspiration on their visit. Regarding bicycle urbanism in particular, there are specific things that they should be looking at, concentrating on and writing down. I'm fond of Barcelona. I, myself, have spent much time in the city, not least on two summer holidays with my kids. We can, by and large, cycle around large parts of the city and feel safe now that some infrastructure and traffic calming has been put into place. 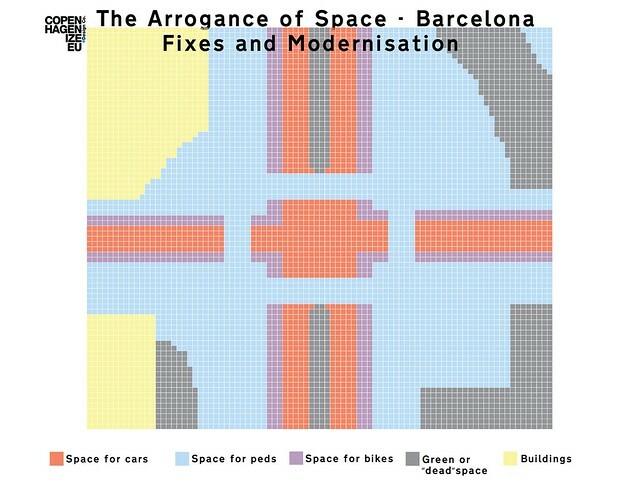 I see Barcelona as a city with massive potential for increasing the modal share for bicycles and expanding on their leadership role since 2008. A fair ranking on The Copenhagenize Index also indicates that the city has done well compared to other large cities around the world. There is, however, lots of work to be done. Together with the Copenhagenize Design Company team in Barcelona, Jordi Galí Manuel and Maria Elisa, we discussed what the city needs to do and what inspiration they need to take home from Copenhagen. 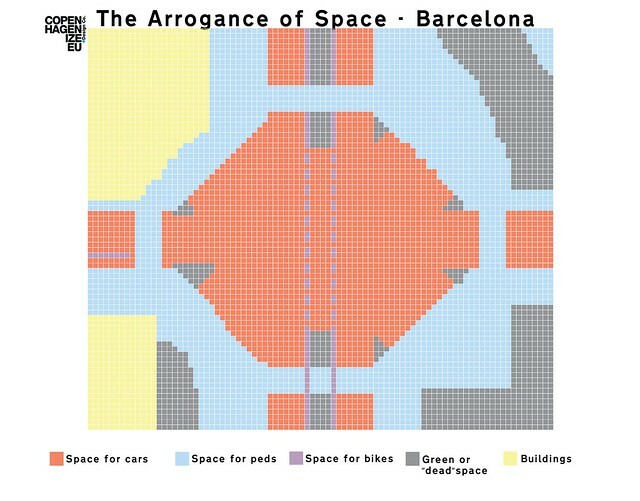 One thing that is bizarre about Barcelona is that despite the fact that Best Practice infrastructure has been around for a century, they've let their planners and engineers make stuff up. Making stuff up instead of using established and tested designs is not a wise use of taxpayer money. One example is the bi-directional cycle tracks leading down the middle of the boulevards. Cyclists in the middle of the street - this is the last place you should be putting them. Having cycled extensively in the city, we don't see the value of making stuff like this up. In addition, the lights are timed so that you have to cycle at a fast pace to hit the wave. At each intersection, there is an ocean of asphalt to cross. 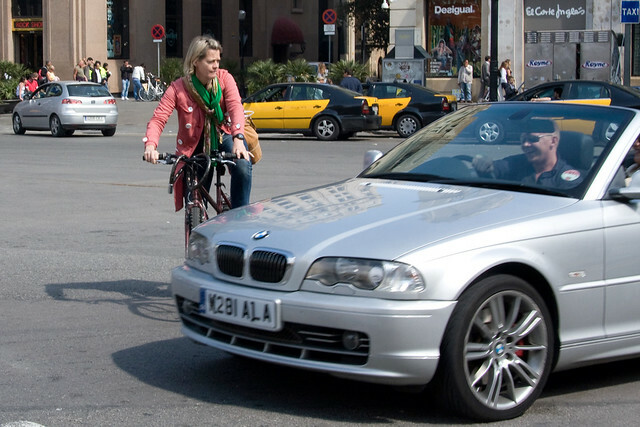 Barcelona should plan for the 99% and adjust the wave to human speeds like 16-20 km/h. The city defends these wacky designs by claiming that they avoid conflicts with bus stop, trash trucks and that they improve safety at intersections. They only made this stuff up recently, so I doubt there is much comparable data - compared to Best Practice infrastructure. Bus stops? Do they seriously think that there are no busses in other cities like Copenhagen? The 5A bus here is the busiest bus line in Northern Europe, with 60,000 passengers a day. There are solutions in place for bus stops and bicycle infrastructure. Copy/paste. Save money. Get the best results. The city is also planning to make stuff up at a large roundabout. Nevermind the fact the Dutch have figured out best practice for roundabouts ages ago - let people make stuff up. It's only human lives you're playing around with. In effect, the City has said that "we don't have as many cyclists as Copenhagen, so we don't need more than narrow lanes in the middle of six lanes of traffic". Rule number one: you are NEVER planning for the cyclists you have now, you are planning for the people who COULD be cycling. Who WOULD be cycling if you had bothered to build decent infrastructure for them at the beginning, instead of paying the double for doing it twice, with taxpayers money. At the moment, the City doesn't have the engineering or planning expertise it needs to go the next level. 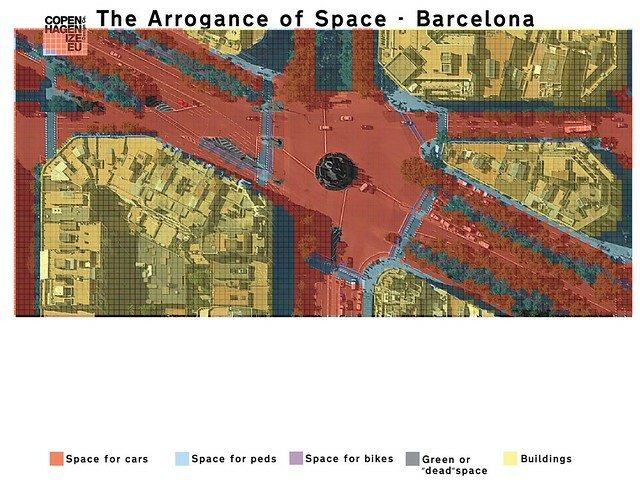 The City of Barcelona has some data but they really don't have enough. Copenhagen is beyond a doubt the best city in the world to gather data about all aspects of urban life. This is a massive takeaway for the Catalans during their visit to the city. The Mayor would be much better prepared for arguing her case if she had reliable data to present to her opponents. The City thinks it is planning for the people cycling now (even though nobody was cycling as recently as 2006) and they seem incredibly uninterested in increasing cycling rates that their official goal is to reach 2.5% modal share. For a city that has done so much for cycling, it's shocking that they can't be bothered to even aim for double digits. 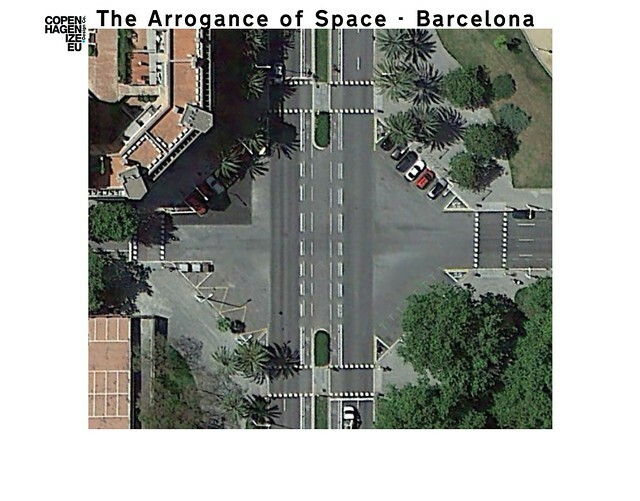 We decided to apply our Arrogance of Space tool to some random streets in the city. Here is a classic boulevard intersection on Carrer de la Marina. The classic form as laid out by Ildefons Cerdà back in in the late 1800s is apparent here. 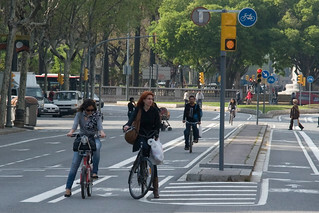 Cerdà planned for humans and sustainable transport but it is clear that the past few generations of Barcelonan politicians have put their money on the automobile and seen these intersections as massive parking lots and high-speed thoroughfares. Cerdà didn't make stuff up but others have since then. 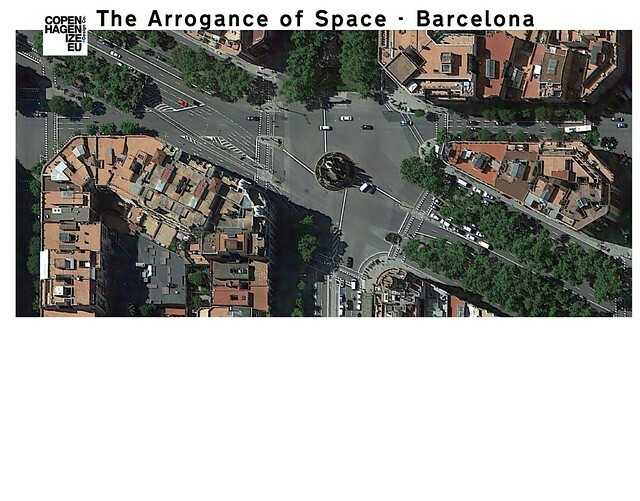 If you apply the Arrogance of Space tool to the intersection, it becomes apparent how undemocratic the space is. Removing the photo and the arrogance is completely and utterly clear. A few people in cars are given an ocean of red space to move around in. Pedestrians have half-decent facilities but when it comes to bicycle urbanism and modernising the infrastructure to accommodate for them, space has clearly not been provided. In Cerdà's grid system, the easiest way to fix the problem is to get a ruler. 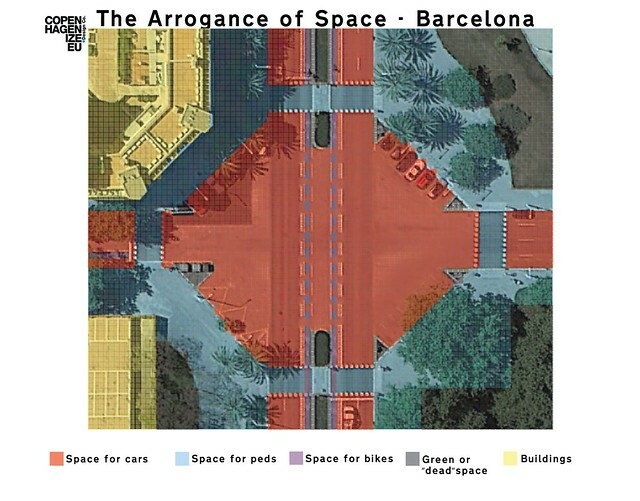 Barcelona prides itself on its public space so there is ample opportunity to improve on that. Make the corners 90 degrees and create public space on each corner. Implement Best Practice bicycle infrastructure along the curbs, where it belongs. What a transformation that would be. Space for cars reduced to what they actually need and a massive win for pedestrians and public space. Cyclists would be afforded world-class infrastructure that would keep them safe and that would encourage more to to take to the wheel. Another randomly chosen intersection on Avenida Diagnol. Cerdà would roll in his grave if he saw what had happened here. Applying the colours and the same pattern appears. Complete engineering arrogance. Cars eating steak and bread crumbs for the cyclists. Pedestrians, too, have to navigate a veritable labyrinth in order to get from A to B.
Barcelona has so many low-hanging fruits to work with. They have been brilliant at traffic calming their cosy streets in the old parts of the city. Cerdà laid the foundation for transport but Barcelona, at the moment, fails to see the potential in the wide boulevards and side streets. It is all right there for the taking. 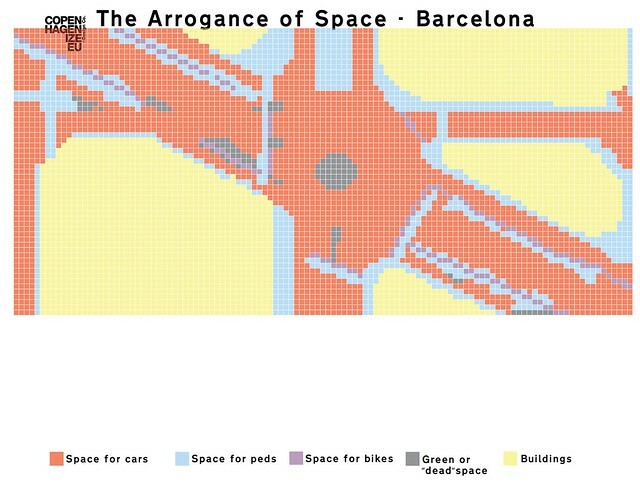 With Best Practice infrastructure, intelligent design and a focus on anthropology related to transport, Barcelona could rock the world with intelligent change.